Please set up an appointment with our design professionals for pricing quotes. SIZE: Up to 1500 Sq. Ft. FINAL FEE: .50 per Sq. Ft. SIZE: 1501 - 2500 Sq. Ft. FINAL FEE: .50 per Sq. Ft. SIZE: 2501 - 3000 Sq. Ft. FINAL FEE: .50 per Sq. Ft. SIZE: 3001 - 3500 Sq. Ft. FINAL FEE: .60 per Sq. Ft. These prices include preliminaries and finals. The following estimated cost for Preliminary and Final drawings is based on an estimated square footage figure. The actual drawing fee will be determined by the actual square footage and be billed accordingly. Braun Building Center will rebate a portion of the drawing fees to customers who purchase lumber and building materials from Braun Building Center. The amount of the rebate is determined at a rate of 1% of the dollar amount of the material purchased at Braun Building Center. The rebate is paid at the completion of the project and will not exceed the original cost of the final drawings. The cost of the preliminary drawings is not eligible for rebate. Payment for all drawing services is required at the time the drawings are picked up. Braun Building Center accepts Visa, MasterCard, Discover, Braun’s Charge, and cash. Two sets of blueprints are included with the cost of the initial preliminary drawing and up to twelve sets with each revision. Twelve sets of blueprints are included with the cost of the final drawings. Additional blueprints are available at an extra cost. The party that pays for the drawings is responsible for the cost of any additional blueprints required. The original drawings and all rights to those drawings, including copyright, are the property of Braun Building Center. 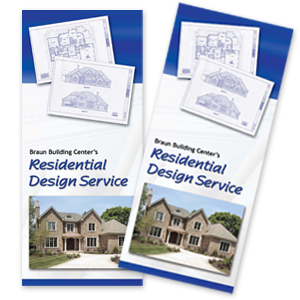 *All pricing is subject to change – please visit a Braun Building Center Residential Designer for an official pricing quote.